Dexster software includes a powerful audio encryption tool to protect your audio files from being accessed by unauthorised user. This is very useful especially you dealing with confidential audio file and act as a protection to prevent unauthorised access or misuse of the audio file. To access to this feature, click on Tools menu, select File Protection, Encrypt Audio File. You'll need to specify the Password Phase and also the Encryption Key Size. Then, click on Encrypt Audio File and select the audio file for protection. 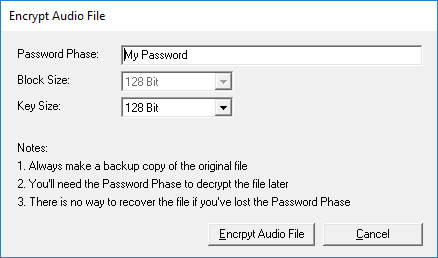 To decrypt a previously encrypted audio file, click on Tools menu, File Protection, select Decrypt Audio File. You'll need to specify the same Password Phase and Key Size in order to unlock the protected audio file. 2. You'll need the Password Phase to decrypt the file later.